I'm looking at 2117 Orwell St on www.realestateone.com.com and would like some more information. ENJOY THE MAINTENANCE FREE LIFESTYLE IN THIS EXCELLENT CONDO IN GREAT LAKE ORION LOCATION IN THE HIGHLY SOUGHT AFTER PARKVIEW COMMUNITY OF LAKE ORION. ENTER INTO THIS HOME TO FIND HARDWOOD FLOORS THAT LEAD THROUGH TO THE KITCHEN FEATURING PLENTY OF CABINET SPACE, GRANITE COUNTER TOPS AND BREAKFAST NOOK WITH ACCESS TO THE BACK DECK. THE VAULTED CEILING GREATROOM HAS PLENTY OF WINDOWS FOR AMPLE NATURAL LIGHT AND A FIREPLACE WITH WODDEN MANTEL. THE MASTER SUITE BOASTS A TRAY CEILING, LARGE WALK IN CLOSET AND ATTACHED BATH WITH DUAL SINKS AND WALK IN TILED SHOWER WITH MULTIPLE SHOWER HEADS. A SECOND BEDROOM, FULL BATH & LAUNDRY FINISH OFF THE ENTRY LEVEL. THE BASEMENT IS FULLY FINISHED WITH TWO ADDITIONAL BEDROOMS, A THIRD FULL BATH AND PLENTY OF EXTRA LIVING & STORAGE SPACE. Our Michigan real estate agents can answer all of your questions about 2117 Orwell St, Lake Orion MI 48360. 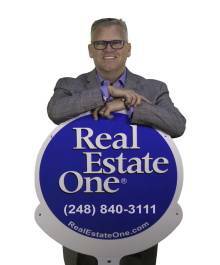 Real Estate One, Max Broock Realtors, and J&J Realtors are part of the Real Estate One Family of Companies and dominate the Lake Orion, Michigan real estate market. To sell or buy a home in Lake Orion, Michigan, contact our real estate agents as we know the Lake Orion, Michigan real estate market better than anyone with over 100 years of experience in Lake Orion, Michigan real estate for sale.